Cold Nose - Warm Heart! Welcome the winter season with free sewing patterns! 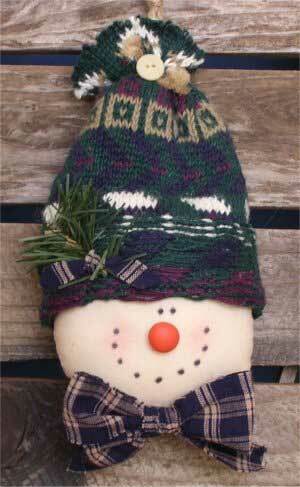 Easy and fun to sew - Clyde the Snowman sewing pattern is a snowman head with a hat made from a recycled sweater. Use as a door hanger or Christmas tree ornament. Cut 2 snowman head pieces out of muslin following the cut line of the pattern. Sew on the stitch line shown on pattern, leaving about an inch to turn the piece inside out. After stitching, turn inside out and stuff firmly with the Polyfiber Fill. You can just hot glue shut the hole you used to stuff (or sew it if you are ambitious!). I just glue and make sure that is the very top of his head so it is covered up when you add the hat. Use about 8" of a sleeve from an old sweater. (If the sweater arm is too large for his head, you can cut it on the seam and make a new seam - either sewn together or lightly glued together. Place the sleeve on the snowman's head so about 2" of the top of his head is covered by the sleeve, and roll the bottom section up about 1 1/2", forming a cuff. Hot glue onto his head all the way around. Now loosely tie a piece of jute around the top of the hat. Using about 10" of another piece of jute, tie it so it is a circle and stick one end into the top of the hat, far enough in so when you tightly tie the top of the hat, it will form a secure loop for hanging. Tightly tie the jute on the top of the hat. Cut the ends off and add a small button to the center (see picture). Using a permanent marker (might want to mark it first with a regular black pen for placement) add the snowman's dots that make up his eyes and mouth (see photo). Paint the wooden button orange and glue as picture shows. Make a bow from material scraps and hot glue to the bottom of his face. You may make as many of these as you want, and sell the finished product at craft shows, art festivals and other handmade affairs. You may not sell this copyrighted pattern, nor is this pattern or the finished product to be manufactured for wholesale. This pattern is original cannot be reproduced on the web or otherwise without permission.